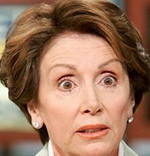 TPM.com--House Minority Leader Nancy Pelosi (D-CA) threw her weight behind the Occupy Wall Street demonstrations Thursday, showering praise on a movement that has so far spread to dozens of cities, including Washington, D.C.
“The message of the protesters is a message for the establishment in every place,” she told reporters in a Capitol press conference. “The message of the American people is that no longer will the recklessness of some on Wall Street cause massive joblessness on Main Street. So far, Occupy Wall Street has drawn vocal support from former Sen. Russ Feingold (D-WI) and a handful of progressive lawmakers, including Rep. John Larson (D-CT), who heads the House Democratic Caucus; Rep. Louise Slaughter (D-NY), the ranking Democrat on the House Rules Committee; and Sen. Jeff Merkley (D-OR). Yes, I hope that God continues to bless them as well... With scabies, bad weather, criminals in their midst, hunger, thirst, and that no one comes to their aid. Shiftless layabouts with Master Degrees in Puppetry deserve to starve. in terms of this topic, produced me for my part consider it from a lot of varied angles. thing to do with Lady gaga! Your personal stuffs nice. Why viewers still make use of to read news papers when in this technological globe the whole thing is presented on web? article posted at this web page is in fact fastidious. What's up, after reading this amazing article i am as well delighted to share my know-how here with colleagues.